Bailiff have been buzzed about in the Chicago music scene for a while now thanks to their debut EP, Mm Hmm, and tight live performances both headlining and supporting acts such as Poi Dog Pondering, Gringo Starr and The Cave Singers. The band will soon start recording their debut LP, but first they will headline a show at Lincoln Hall on Saturday, January 9. 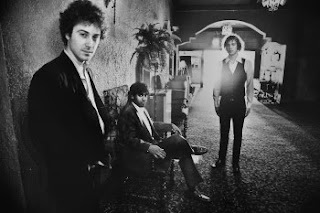 The term "blues" usually comes up when describing the three-piece's music - and while blues elements are undeniable - there's much more to the picture. To my ears, it's gritty, slow-burning rock and roll that's as experimental and progressive as it is traditionally bluesy. At Lincoln Hall, the band will not only play tracks from Mm Hmm, but also debut new songs that will appear on their forthcoming record. To check out their sound, download a track below and click here to get a copy of the full EP. To learn even more about Bailiff, read our Q&A with guitarist and vocalist Josh Siegel. Download mp3: Bailiff - "Even I Know the Rain"
Bailiff was amazing last night! Anyone who decided against braving the cold to see this group truly missed an opportunity to be part of an up and coming band. Bravo!